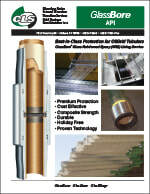 Cost Effective - GlassBore® Glass Reinforced Epoxy lined tubing provides premium ID protection against corrosion. 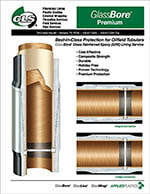 Composite Strength - GlassBore® GRE is fabricated from a fiberglass reinforced epoxy resin system. Durable - GlassBore® provides a reliable, impact-resistant barrier against mechanical damage. Holiday Free - GlassBore® eliminates ID exposure to corrosive fluids and gases, extends life of tubular goods in corrosive service. Proven Technology - Glass-Reinforced Epoxy is widely recognized to be a longer lasting alternative to Internal Plastic Coating. Compatible - GlassBore® is dimensionally similar to competitive GRE-lined tubular products and can be made up in mixed strings.